Japanese cheesecake – cotton soft, light, pillowy, the BEST cheesecake recipe EVER. Tried and tested, a MUST-BAKE for cheesecake lover! When I was home in Penang a couple of months ago, my contributor CP Choong baked these cotton soft Japanese cheesecake and gave me some to try. Oh my, they were so good and exactly like the title of this post, cotton soft…and cheesecake. Japanese cheesecake is very different from the regular cheesecake; Japanese cheesecake is soft, light, cottony, and absolutely to die for. I know I have to share this amazing Japanese cheesecake recipe with you all. You can keep it in the refrigerator for a couple of days. You shouldn’t have to worry about the leftover because this is the BEST cheesecake ever, and I can assure you that you won’t have anything left to keep for more than a day! How Do You make Japanese Cheesecake? I have the detailed Japanese cheesecake recipe here. In summary, step 1 is make the batter by melting cream cheese, butter and milk over a double boiler, then fold in the flour, the corn flour, salt, egg yolks and lemon juice. Then, whisk the egg whites with cream of tartar until foamy. Then fold in the meringue with the cheese mixture and bake the cake. How Many Calories Are in Japanese Cheesecake? Japanese cheesecake has the lowest calories of all cheesecake. Each slice is only 200 calories. Make this and I will guarantee that you will never go back to regular cheesecake again! Japanese cheesecake is best served on its own, with your favorite cup of tea or coffee. For an Asian-style afternoon tea, make the following treats to go with it. Japanese cheesecake – cotton soft, light, pillowy, the BEST cheesecake recipe EVER. Tried and tested, a MUST-BAKE for cheesecake lover!! Melt cream cheese, butter and milk over a double boiler. Fold in the flour, corn starch, salt, egg yolks, lemon juice and mix well. Take 1/3 meringue and fold into the cheese mixture, then fold in another 1/3 of the meringue. After incorporated, pour the batter back to the remaining 1/3 meringue and fold. FOLD GENTLY. Pour the mixture into a 8-inch round cake pan (lightly grease and line the bottom and sides of the pan with grease-proof baking paper or parchment paper). 1. I baked the cake in a 9" round tin, I did not line the sides. 2. If you use a 8" pan, it is very important to line the sides of the 8" pan with parchment paper, make sure the parchment paper extends higher than the cake tin by about 1.5". 3. If springform pan or loose base cake tin is used, wrap the base of your cake tin with 2 layers aluminium foil, to prevent seepage. 4. I baked the cake on the lowest shelf in the oven (to prevent cracks on top and over browning). 5. The purpose of using double boiler is to melt the cheese, butter, and milk mixture. I heated and simmered the water in the double boiler ON the stove. For the water bath, I used hot water. 6. I left the cake to cool down in the oven with the oven door open, about an hour. This is to prevent sudden change of temperature that may cause the cake to shrink drastically. It's normal that the cake will shrink about 1/2 inch to 1 inch after cooling. If the cake shrinks a lot, the main reason is over mixing the egg white mixture with the cream cheese mixture. Beat the egg whites until soft peaks form, FOLD VERY GENTLY, do not stir or blend. 7. Refrigerate the cake (with or without the cake tin) for at least 4 hours or overnight. I had no idea that Japanese cheesecake even existed but if this cake tastes half as good as it looks……I’m a happy woman! The top is just beautiful and maybe I won’t ever go back to regular cheesecake again. Line the base of a 7″ round cake pan(fixed base) with parchment paper and grease the sides with butter, set aside. Separate the eggs and leave egg whites to chill in the fridge until ready to use, this helps ensure a more stable meringue. Fill a saucepan with water to about half full. Bring the water to a full boil. Turn off the heat. Place white chocolate chips in a large mixing bowl and set it over the saucepan (make sure the bowl is bigger than the sauce pan). Stir chocolate till smooth. Add cream cheese and mix till smooth. Remove mixing bowl from the saucepan. Add the egg yolks, with a balloon whisk, whisk to combine. Add vanilla extract (if using), whisk to combine, set aside. Add the beaten egg whites into the cream cheese mixture in 3 separate additions, each time fold with a spatula (I used a balloon whisk) until just blended. Pour batter into the prepared pan. Tap the pan lightly on a table top to get rid of any trapped air bubbles in the batter. Place cake pan in a baking tray. Fill the baking tray with some hot water. Place on lower rack of the oven and bake at 170 degC for 15mins. Lower the temperature to 160 degC and bake for another 15 minutes. Turn off the oven temperature and leave the cake inside the oven for another 15 minutes. Remove cake pan from oven and leave the cake to cool before unmolding. Refrigerate for about 2 to 3 hours. Dust with icing sugar if desired. Recipe source: from Anncoo Journal and this video by ochikeron. Get your own blog, leaving whole recipes on someone else’s comment section is obnoxious. The only obnoxious one is you for bringing them down. It’s just another interpretation of a recipe. Calm down. What is double boiler ?? Also known as a ban marine. .
A double boiler is not a bain-marie. In a bain-marie the bowl or pan sits directly in simmering water. A double boiler sits above the water and it is important that the water does not touch the bottom of the pan or bowl. The cushion of air is important in controlling temperature. A nice recipe. Thank you. where does the salt in the ingredients list go please? From the adapted recipes, it wasn’t mention at all too, but I think you can just add into the flour mixture when sieving the flour before hand. Mine fell when cooling? ? Your meringue is not beaten enough, that’s why. Do you know if i can use 8 oz of cream cheese instead because my nearby grocery store only sells 8 oz packages of cream cheese? where i can buy Japanese cheese cake mix in dubai? I wish to try it at home but i need to buy cheese cake mix. do you help me to get contact number of any supplier? Sorry but I am not sure. Thanks for a deliciously looking recipe. May I ask when you leave the cake to cool in the oven for 1 hour, do you first remove the cake tin from the water bath i.e. just the cake in the tin? Secondly, since the cream cheese usually comes in 8oz bar, is it detrimental just to use 8oz and not 9oz per recipe? Thanks! Here is the response from CP Choong, the contributor of this recipe: you may leave the cake in tin to cool in water or without water. If you don’t feel too dangerous or too clumsy to remove the hot water pan from oven and quickly pop back the cake (with tin) back to oven. I got burnt once with the hot water splashing when moving out the hot water. Also depends on how what size of your water bath pan, some people use the shallow pan (black color that comes with the oven) that is too dangerous to remove. BUT I use a 12″ round baking tin as the water bath pan. I made the cheesecake twice and my daughters loved it! Can’t believe they ate the whole thing. I do have one question. The cake on your picture looks for pretty and high, mine’s after it cools off, it shrinks a bit and the top is a bit wrinkly even though I kept the finished cake inside the oven with doors slightly open. Do you know what could cause this? Wrinkly cake means the meringue deflated and couldn’t hold up…probably over-beaten. For soft peak, how long does it usually take to reach and at what speed? I saw that in one of the responses you said that someone’s cake fell because the meringue wasn’t beaten enough yet here, your response for a shrunken cake is that it was over beaten, so I was ordering what it really is that causes the cake to deflate? Over beatened or underbeatened meringue? The meringue has to form soft peaks which means that they are ready. Interesting that you melt the cream cheese. I put it on my list of “to make” recipes and I hope I can make mine so it looks like the picture! Very nice cake and thanks for sharing.Would appreciate your advice on what knife or best way to cut the cake to ensure a perfect slice like yours. Any technique to make sure the cake doesn’t stick to the knife. Thank you. Response from CP Choong, the contributor of this recipe: I use normal knife but I warm it with hot water before cutting. But the cake will definitely stick to knife because the texture is more or less like pudding. The best is wipe the knife clean after each cutting. Also, cut it straight out from the fridge. Fishing line works great. It must be wiped each time. Cut a long piece big enough to cut cheesecake in half then half again, half again until you have equal desired pieces. I remember eating the Japanese Cheese Cake from Lavender before. The texture is really tender, soft, cottony and light as you mention up there. I’m hungry just by looking at the picture. By the way, thanks for sharing this recipe. Can’t wait to try this. My son will definitely love it. Hi, im one of your ardent fan. I’m a newbie to baking. May i know what is water bath?? Did yours rise stay that way? Did it shrink after it has cooled? Do you mind sharing how long and at what speed did you beat the meringue? Can I make a smaller cake with half d ingredients..wl it turn out just as nice?? I guess you can but you need to use a smaller baking pan 6″ or 7″. Can’t wait to try this. How do you make the decorations on the top? The design is bought…nothing fancy…stencil design. Great looking recipe! I just found stencil for top design eBay at http://www.ebay.com/itm/Pack-of-4-Variety-Cake-Template-Mold-Cupcake-Stencil-Birthday-Spiral-Decoration-/251740714883?pt=Cake_Decorating_Supplies&hash=item3a9cea7783. Hi, do I use salted or unsalted butter? May I know why unsalted? Can I use salted? I went to http://www.thelittleteochew.com to see if there are more tips. I then found out there was no lemon juice mentioned in the ingredient list. May I ask if this lemon juice is added on after original post? Thank a million if you could ask CP Choong. The picture looks so awesome,I must try this weekend. Tks for sharing this recipe. Hi, do you use room temperature water or hot water for the oven? I have tried this recipe, but my doesn’t turn out as your picture shown. It doesn’t come out as soft as you have mentioned. What did I do wrong? Jessica do you have a picture to share? Thanks for your reply. So the water in the water bath should be hot water right? The double boiler is NOT to be heated on a stove am i right?? Please check Cook’s Note. Water bath is hot water. Double boiler heated on stove. This cheesecake was so light and super delicious the only thing is that mine cheesecake shrunk like an inch from the top and a little from the sides. Did I do anything wrong? Other than a delicious recipe. The cake is super soft and yummy. However, mine shrunk quite a bit too. I always have this problem with cakes with meringue. Anyway, thanks for the recipe. Shrinking a bit is normal. Do we really need to chill the cake after bake? Thought Japanese cheesecake is normally eaten warm. Hi, I made this cheesecake today and followed exactly all the ingredients and method. Baked at 160 deg.C for one hour in a water bath as required. The cake cracked and the sides were wrinkly…I must admit, I forgot to grease after I lined the base and sides. No where near the image which you posted but it was light and delicious! Getting the right stage of meringue is important. Soft peak form and the texture should be silky smooth and bubble-less. This is how it should look: http://www.craftpassion.com/wp-content/uploads/2012/02/Make-Cranberries-Lemon-Zest-Steam-Sponge-Cake-3.jpg. Hi there, tried this today but my cake shriveled like dried prune n looks so ugly. One thing that happened was I missed out d sugar. What other possibility made my product shriveled? Also the top cracked so I turned down the temp to 140 deg instead will try it again but appreciate if you could give me pointers for correcting my mistakes. hi Azizah, here is the response from CP Choong, the contributor of the recipe: The ugly looking cake, cracked top are mostly caused by the meringue and the heat. (Remember I also failed so many times). Getting the right stage of meringue is important. Soft peak form and the texture should be silky smooth and bubble-less. This is how it should look: http://www.craftpassion.com/wp-content/uploads/2012/02/Make-Cranberries-Lemon-Zest-Steam-Sponge-Cake-3.jpg. The cracked top problem means you over beaten meringue which is drier compared to soft peak form meringue, this would cause cracks. Also, sugar is crucial for meringue making. Without the SUGAR, bubbles volume (in meringue) will deflate faster. Your problems were caused by sugarless meringue. Tried this recipe today and it came out perfect! Thank you so much for sharing. It is very important to read the notes and follow them! This cake is so delish. My favourite. Not easy to make but knowing the right techniques is crucial. I failed first 5 times, my 6th attempt made it right to get the correct texture and not sinking too much when it is done. However I still couldn’t get the side and top part of the cake smooth looking. The side is slightly wavy and top of the cake is not really smooth. It have fine little bubbling holes. By the way, what causes this. How to make it right? Please advise. Thank you. Are the patterns dusted with icing sugar? Please advise. You could place a paper doiley on the cake, dust with sieved icing sugar and carefully remove the doiley. Presto – a lovely design! i tried this today and the cake look so pretty, but when i cut into it, the bottom 2/3 has the texture of cheese, too dense…what did i do wrong? I notice that i couldn’t get the meringue to be thick enough, a little on the runny side…could this be why the cake has the texture of ‘cheese’? You have to make the meringue to be soft peaks like the picture linked from in the recipe section. Hi mine is no wrinky the cake is soft it didnt shink after i take out from the oven but it didnt rise as i expected and why the cheese went down and separated the cake batter . it looks like i made a steam flan japanese soft cheese cake. What seem to be the problem? You didn’t beat the egg white correctly. hye.. if I don’t have any cake or superfine flour, can I just use the all-purpose flour to substitute it? Hi I’ve tried this recipe twice in one day and failed both times. They turned out shriveled. The meringue was good,looked like yours in the llink. Could it be the folding? Do you have photos to show how to fold? Thanks for the recipe! Will try soon! I will be trying this soon! Looks great! Your recipe didn’t say what size eggs. Are you using Large or Med eggs? Will this cheesecake still come out soft using a gluten-free flour mixture? Hi….the cake looks wonderful…i just have a doubt…do you have any alternatives for eggs as we are vegetarians. If yes, what could be the best alternative and what quantity? I don’t think you can make this cheesecake without eggs. Sorry. this is actually pretty cool because I was just telling my father in law that I wanted to try making a cheesecake by making meringue first and see how it would work out. I didn’t realize it was an actual recipe. So, I’m super excited to try this! Hello, just wanted to let everyone know that I made this last night and it came out just as described. It deflated about 1/2″, which is normal, but I did do one thing differently. I substituted regular cream cheese for Mascarpone. Oh boy, the cake tastes amazing. Wow Sean, sounds amazing, I will have to try my Japanese cheesecake with mascarpone in the future! Hi, I really enjoy your posts! I tried making this cheesecake twice today and both times the tops were level with my 9″ cake pan after cooling, not dome shape like yours. The top didn’t crack but became wrinkly. How can I get the top to look smooth and domed? I baked for actually 55 minutes because I could tell the top was going to crack if I baked it longer. Thanks! This cheesecake is similar to a souffle. I expect your dome was wrinkly because you over-whipped the egg whites, or used too much cream of tartar. Unfortunately, the recipe does not specify the size of the eggs used, but if you used smaller eggs than the original chef did, you’d have less white, and thus too much cream of tartar. The most likely culprit however, is the whipping. Hi may I know what is water bath? Do you have picture to show bcos I just started to learn how to bake. The standard substitute for cream of tartar is either lemon juice or vinegar (your choice of which, depending upon what you plan to make). For this, I chose lemon juice. 1/4 tsp of lemon juice for the 6 whites was perfect. How long to bake in a 8in pan? Can I ask why do you have to refrigerate the cake overnight? It’s supposed to be cold when served. If U use cream cheese spread instead of Cream cheese, would it be okay? Can I use a different cheese, maybe cheddar? I don’t think so. Please follow the instructions. Just want to ask about how long should I bake this cake if I’m using a fan forced oven? And at what degree. If you mean convection oven when you say fan forced, just adjust 25°less so °325 regular oven would be °300 on convection oven. 1) How important is to weigh the ingredients instead of measuring? I don’t own a scale due to lack of space. 2) Fresh milk? Can regular whole milk (UHT) from the store work? You have to weight it this recipe has to be very precise. Yes on milk. Thanks for the answers. Guess I’m going to have somehow some space in my crowded kitchen for the scale before attempting the recipe. Just made one! Thanks for the recipe. 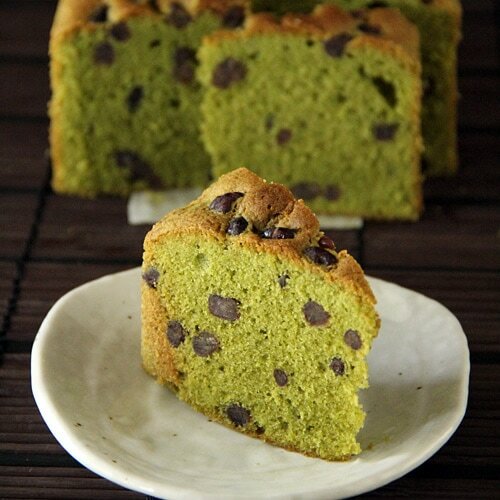 I always buy this cake at the Japanese store – now I can make my own. It was all perfect and browned beautifully until it kind of wrinkled in the end. I don’t think it has to do with the meringue since I was very careful to get a soft peak and only folding it not over mixing it. I suspect it has something to do with temperature change. But I also followed the tip and left it to cool in the oven. Someone asked about baking in convection oven. I used mine and just converted to convection temperature which is 25 F lower. Oh well… It still tastes great. Didn’t wait to get cold, had a piece warm and it was delish. Sorry, if this is a bit off-topic, but I decided to look at the two recipes this recipe is based on. I couldn’t access Little Teochew and was directed to a Google Blogger sign-in page. I’m not sure what I’m supposed to do in order to access Little Teochew. I tried using my gmail sign-in info and nothing. From what I read online a number of ppl reference Little Teochew which makes me even more interested to read Little Teochew’s post. For those who were able to access Little Teochew, can you please let me know what I need to do? I submitted what I thought was a request to Little Teochew for access, but I haven’t heard a thing. Fyi, I’m not a blogger (and have no interest in blogging) so maybe that’s the issue. Any help would be appreciated. Thanks. I am not sure what happened to Little Teochew website…sorry I can’t be of much help. Darn… I guess it’s good to know that it wasn’t me and there is something up with the Little Teochew website. I wasn’t sure since I had never been on the Little Teochew website before my attempt to view the Japanese cheesecake post. Hopefully, Little Teochew will be restored. If anyone is somehow able to access Little Teochew, can you please reply to this? I would appreciate it. Thanks. I would very much like to read Little Teochew’s notes on this. Hi…thanks for the lovely recipe..cant wait to try it out! but just out of curiosity, is it possible to reduce the grams of cream cheese from the recipe ? many thanks! No, please follow the recipe precisely, it’s a very sensitive cake. Hi Rasa, happy new year! I was wondering do you use a 9″ x 3″ pan or 9″ x 2″ pan? Also, please advise on the easiest way to remove the cheesecake from a regular cake pan. Yours looks so beautiful and amazing! If I use cake flour is it necessary to use 20g cornstarch? Just follow the recipe as is and don’t make any modification. The top part of my cake seems to be burned already at 40th minute. I put it at the lowest rack and set the temp at 160. What could possibly be the reason? In your instructions you mentioned “or until golden brown”, if mine turned golden brown at around 30 mins, should I have turnd it off already at that time? Different oven is different. Yes you should have taken out and check if the inside is cooked. Also, you can cover the top with aluminum foil from browning too fast. How did you get the cake out of the pan? Thanks for the recipe! BTW I have a small convection oven and I don’t think making a water bath would be possible is it okay if the cake pan is not submerged in the water, instead it will be on top like a steaming? I use dental floss to cut my cheesecake. the fine granulated sugar in the recipe is that the same as confectioners/powdered sugar or is it regular granulated sugar? Can you put me on your mailing list please. I was based in Penang for a few years to 1980 & enjoyed all the fantastic foods. Hi, do u preheat the oven? Thanks for sharing this recipe. I have tried it once and all my family loves it…the taste is perfect not too sweet not too plain…all perfect. 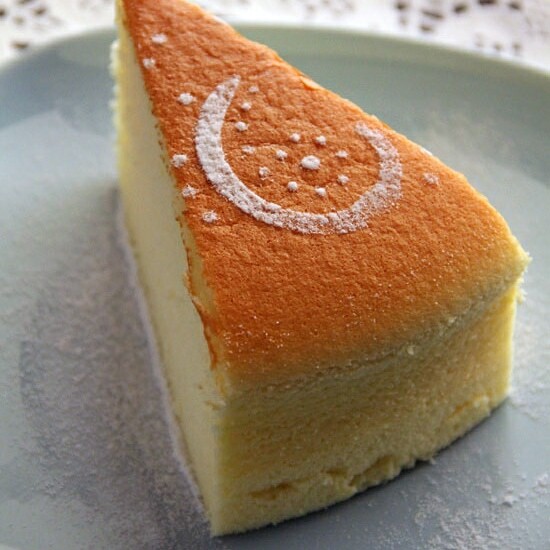 I have to make the Japanese cheese cake,it looks so good! 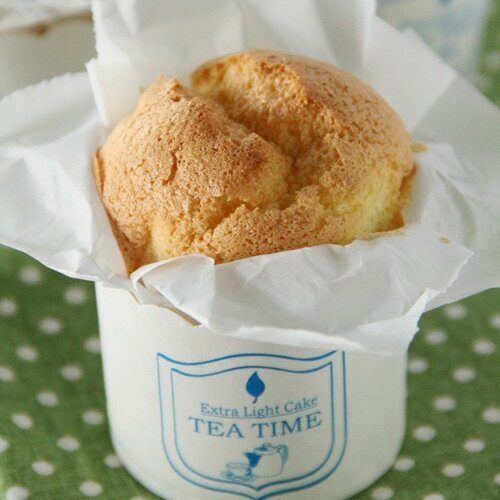 Can another fine flour, such as rice flour, be used in place of the cake flour? I would like to try making this for my wife, but she has celiac disease and cannot consume any type of wheat flour. Alright, just made one. Was my first ever attempt at whipping egg whites, I heard it can be tricky. The end result is nowhere near as pretty as yours, but it still tastes delicious. It ended up being a bit heavier on the bottom and lighter on top – I’m assuming I didn’t whip the souffle enough. Also I couldn’t make a proper water bath (no baking tray large enough), so the cake pan wasn’t sitting in water, but suspended right above it. It was still a great first try, thanks for the recipe! Have tried baking this cake 5 times already and it still comes out with a denser bottom. I’ve looked up many techniques on folding and I think I have that part done properly. Could it be the oven? Mine is fan-forced and I put it on the bottom most rack. Jas – I am sorry but I am not expert in oven…not sure. Im planning to make this tonight, but i dont have cake flour at the moment. What difference will it make if i use all purpose flour? I bake cheesecake daily (working in a bakery) and did not realize that mine is very similar to the Japanese cheesecake. There is a detailed explanation about the technique I use in my blog too. 1. Mix (A) with an electric mixer until it becomes fluffy and homogeneous. 2. Beat (B) with an electric mixer until the cornflour is well mixed with the egg. Combine (B) and (A) and mix well. 3. Beat (C) until it reaches a density that is able to form stiff peaks when the mixer blade is lifted up. Add to the mixture of (A) and (B). 4. Beat the egg whites with the superfine sugar over a hot water bath until soft peaks are formed. Fold the egg whites into the batter in (3). 5. Crush the biscuit and mix with the melted butter (as in E), Place the biscuit / butter in a round baking pan. Press firmly to form a solid base. 6. Pour the cheesecake batter to the biscuit base. 7. Place the unbaked cheesecake in a larger pan and add enough boiling-hot water to reach halfway up the side of the smaller pan. Place it in a preheated oven at 150 degrees Celcius for 100 minutes. 8. Remove from the oven. Keep in the chiller until it is cool. Any changes for high altitude? I live at 5280 ft. I have made your cake successfully and let’s say it didn’t last more than 24 hrs . I would like a little more lemon taste so could I increase the lemon juice or would that change the whole mixture? I also thought of fine grated lemon rind? I think you can add the lemon rind but adding more juice I am not sure as this is a very sensitive recipe! Tried this cake yesterday and turned up so well. Thanks the recipe. Thanks Mangales for trying my Japanese cheesecake recipe. Hi, this cheesecake recipe is great. I have made it a few times already. Do you know why the bottom part of the cake is denser than the top? Initially I thought I may not have mixed the meringue well with the cake batter and so I tried to fold more thoroughly. But the cake is still denser at the bottom. Hope you can advise. How long to make the egg white because mine turned out doesn’t look like your..? It’s not about the time, it’s about the egg whites become meringue and have soft peaks. My cake looks so pretty! No wrinkle and no shrink but it tastes like steamed egg custard, more savory side than sweet side ;( Should it taste like this? Maybe you used a cream cheese spread that has added salt? Use Philadelphia brand cream cheese (not spread), or cooking cream cheese (usually with a dessert on the packaging) for best results. I used a 9 in. Round and the batter was starting to overflow before it even went into the oven! I took some of the mixture and put it in a smaller pan since there was obviously too much for the 9 in. round. Recipe seems nice though, hoping the cheesecake turns out ok despite having to separate some of the mix. May I leave out the tartar? The first time I baked, the top part cracked but I know it was due to the over beaten meringue. The texture of the bottom of the cake is western style cheesecake. As for the second time, the meringue is perfect, the top is perfect, but 1/3 bottom of the cake is western texture cheesecake. May I know what is the reason? I have already place the cake at the lowest rack but the top is still over browning. I live at about 5500 ft above sea level. Any suggested changes? The middle was a bit sunken. Thank you! Is there a way to check for doneness? Could I stick a toothpick in without deflating the cheesecake? 60 g/2 oz. cake flour. If 2 oz is 60 g, why 1 oz is not converted to 30 g? I just baked it but once I turned off the oven and open the door a little it was inflated a lot. When I was folding the egg white foam with the cream cheese mixture the bottom became runny. It turned out dense on the bottom and flat. What went wrong? I meant to say deflate not inflate. Lol. I was just wondering if it’s possible to substitute cake flour with all purpose flour + cornflour – or will it be too much cornflour since I noticed that your original recipe contains cornflour as well? Secondly, are there any substitutes for cream of tartar as well? Thank you. Please follow the recipe exactly. This is a very sensitive recipe. I have baked this cake 4 times and it has always been very delicious. But it always blows up into like a balloon and sinks a lot, and becomes very wrinkly, what could i do to prevent this? I have tried this recipe. It tastes good but flavor was too eggy wish I could add vanilla essence. Don’t you add vanilla essence in this recipe? Looks sooo delicious. Thanks for your recipe, so easy to understand. Is there any way I can use honey in place of sugar? I have a 6 and half inch tin, will this recipe work? does this cake kept in room temperature like normal cakes or in the fringe? I tried doing this.. but after it is leave out from the oven it shrinks a lot and become wrinkly.. i hv check the comment before. I pretty sure my meringue does beat properly. Could it be the water bath to be the factor? Or is it because the temperature changed? Might be the temperature change. hi! i looooove japanese cheesecake and i really wanna try and bake it. i currently do not have a round pan, can i bake this using square or rectangular pan? thank you! ? You can try, I think they should work. Love your recipe. Follow it to the T, it turned out fantastic. Thank you. As everyone said above, the recipe is fantastic, I’ve done this 3 or 4 times now! I have one question though, would this recipe go fine with a chocolate icing and/or some berries? I’ve tried this recipe and I got an eggy layer on the bottom… My top is perfect, what happened? And any tips? Hi good day, i want to try your recipe, but i dont have cornflour/ cornstarch, can i just use cake flour? How much will i use? Is there any difference on the outcome of the cake if not using cornstarch? Just follow the recipe exactly. Hi, I forgot to add cornflour to the cream cheese+yolk batter. I added it after I added the meringue. Would this ruin my cheesecake? I am not sure about that video but this recipe is very very good and authentic. Hi, I’ve tried baking this cake twice and both end up into 2 layer cake, cottonny on top with kueh like bottom.Not that I’m complaining since it still taste great,but I really hope I get it right next time since I love this cake.Do you have any idea why it turn out like that? I’m assuming ‘cake flour’ is ‘self-raising flour’ and not ‘plain flour’… is that correct? Thanks. Looking forward to making this recipe. Cake flour is for cake. It’s different. Can you make them into cupcakes and what would be the tempature. How do you tell if it is done too? I think you can but I haven’t tried so I can’t tell you exactly! Does the baking time differ in an 8″ pan? Not sure since I didn’t try. Hi! Tried this recipe and it turned out well. Though at my end I need to adjust the temperature of the convection oven as the top was a little burnt. Thanks for sharing this recipe! Keep up the good work! Awesome, so glad it you liked this Japanese cheesecake recipe. I just made this recipe, the texture was very nice, very light and fluffy. It did crack slightly on the top. However, I found there was bit too much sugar, I would have reduced it to 100g instead of 140g. Also for someone who is used to American style cheesecakes, this tastes nothing like it at all. It has a very distinct eggy taste that I couldn’t quite get over. I added some lemon zest and I think that helped the flavour a bit, I would also recommend adding some vanilla extract, perhaps between 1/2tsp to 1tsp. And lastly I did not have cream of tartar so I didn’t use it and it still turned out okay. Yes Japanese cheesecake is nothing like American cheesecake. It’s like a spongy cake with cream cheese flavor. Wow, really hard to find the recipe, which is what the majority of people are looking for and very hard to leave a comment on this site without having to scroll through all the other comments first. Sad. Yes, you can, just click the the word Comment below the Recipe name at the top of the page. Hi love ur recipes . I read that baking is done without fan forced oven. But my oven is pretty much fixed at it. Can I still bake this cake and at what temperature please? Have tried baking but not gettIng the right light texture so wondered if it’s the oven. Hi. I baked this cake today & it turned out pretty good except there was two giant cracks on the top while baking. how can I prevent this? Also do you bake with fan force? (i did). & do you leave the cake in the water bath while its cooling in the oven? thanks! Japaneese cheese cake. So tasty, so fluffy! Just wondering, can this be made using vanilla or almond extract as flavor and omit the lemon juice? Awesome Recipe.. Thank You so much Rasa Malaysia. Came out perfect on my first try and everybody had heaps of compliments. Definitely a recipe for keeps… For those who want to try, please read all the comments, and follow the recipe to the dot. You cant go wrong. Good Luck all!!! This is “Japanese” cheesecake, as the name says so. What is the starting temperature of the hot water bath? Just follow the recipe, this recipe is very sensitive. I am on a quest to make the perfect Japanese cheesecake. I have tried three recipes including yours in the last two weeks. I think the consistency of the meringue and the amount of folding are the critical success factors. When I followed your recipe to the T, the cheesecake came out in two layers–top of lighter and has a lot of holes, and bottom is dense but smooth. Do you know what I have to tune to get the perfect cheesecake? Another question I have is, do I have to sit the pan in the water bath, or can I use a steaming rack and sit the springform pan on top of it? Since I haven’t tried this recipe, I don’t know if the following suggestion will work. I can’t see where it wouldn’t as I’ve used it as per directions in a butter cream frosting recipe. Tale the whites and the sugar and heat them up to about 160 – 170 degrees F. This will help dissolve the sugar in the egg whites and also pasteurize them. Be sure to do this with a double boiler and do not let the top pan cone in contact with the water or you’ll need to start over. I really love the idea of this. I’ve tried this recipe twice now. I used a springform tin the first time and wrapped it with foil but I think I might have got some water seepage. The second time, I went and bought a 9″ tin with a fixed base. 1. It sunk badly once cooled. I’m 99% sure that I didn’t get the meringue stiff enough. Another 30 seconds mixing and it probably would have been better. It wasn’t bad. It was just the dome on top that went flat. 2. The bottom inch or so was very dense. More like a very thick pancake. The inch and a half was perfect though. Light as a feather, full of air and really tasty. So, any idea why this happened? It’s like being in the water bath stopped the bottom rising. The thickness of the bit that went wrong matched the depth of the water exactly. The other thing I wonder is whether I didn’t fold the meringue in enough. It looked right but could it be that the yolk/cheese/milk mix sunk to the bottom and the meringue floated to the top? I’d love to nail this so any advice would be appreciated! I’m new to baking.. Can anybody with experience PLEASE answer my question?? I got a small oven (19 liters) to be exact.. I’ve tried baking this cotton type of cake and it didn’t rise up so nice but it’s still edible.. My question is, does small oven suit baking this kind od cake? I’ve tried so many of the egg folding and maringue techniques but still fail to get the “picture” result..
Nailed it in my first attempt. Tasted yumm with melt in mouth texture. Thanks a lot. Nailed it in my first attempt. Great taste & melt in mouth.. I tried the recipe last night, and it came out great! It wasn’t as visually perfect as yours, but it’s ok. I wish I could share the pic. What would be a good way to add a fruit flavor to this? My friends and I, at an Anime Convention, got to try a strawberry Japanese cheesecake, and it looked very similar to this, but with strawberry flavor! I made this twice, followed the directions exactly. First attempt was a total fail as I did everything per directions and the cheese mixture cooked the egg yolks and the cake was gross. Second attempt I melted the cream cheese and butter then added milk. I waited for that mixture to cool before adding the egg yolks and flour, had success this way. I measured everything exactly on a scale. *****This cake is definitely not for new bakers and not as easy as some stated as it requires experience for this to come out correctly. I made a homemade strawberry sauce to go with finished cake which made the cake better. This is amazing!! and as Brenda said when she baked it we also added a raspberry sauce to go with the finished cake. It added a splash of colour and a tasty zing alongside the creamy sweet cake and, you DEFFO HAVE TO REFRIGERATE over night, alas its not the kind of thing you can eat straight away, no matter how delicious it looks. Today I made them in Muffin tins lined with good parchment wrappers. Still in the water bath of course. I baked them for 35 min and so far they look perfect. I added mango-passionfruit-orange preserves to some of them and they seemed to have handled it well (I wasn’t sure with the preserves being so much heavier than the batter). I also beg to differ and say, they are delicious straight out of the oven already (I had to test one to see if they’re done). Oh, I also substituted the wheat flour with Masa harina to make it gluten free for one of my friends. Hi Sabine, so happy to know that you tested this Japanese cheesecake with great success. When I keep the temperature low, around 300, the cakes rise nicely and don’t crack but they remain palr. When I raise the temperature, they become brown but they crack. As the cake falls however, the cracks close again and just look like “scars”. I camiuflaged this with frosting but love the powdered sugar so much more. Also: after using powdered sugar you better din’t refrigerate beacuse then the sugar disappears. Notwithstanding all of the above, I am becoming famous because of this cake. Hi there. Can I replace Cream of Tartar with any other ingredients? As I doesn’t seem to get one here in my area. I made this cake and it was somewhat a success. I find that the cream cheese mixture doesn’t fold well with the flour mixture. Is it okay to use an electric mixer for that? The cheesecake also have a lot of “egg” taste to it, is it possible to use 5 eggs instead of 6? Or maybe change the egg yolk from 6 to 5? What do you think? I wouldn’t change anything in the recipe and method because this Japanese cheesecake is very sensitive! Appreciated if you could help me on this? My cake turned up to be top fluffy and the bottom was not. is it cause of the folding method? If your bottom was not, it meant your egg white meringue is not beat to soft peaks. They need to be foamy. Thank you for your recipe, my cheese cake is still cracked. I will try more. However, I remember I used to find in your blog the cheese cake recipe which use whipping cream, and at that time I tried that recipe and I really succeed with that recipe. Can you re-post that recipe ? Hi Maggie, I am not sure why cheesecake recipe is that, please search for cheesecake on the site. Rasa, great recipe but how did you get the cake out of the cake pan? I used parchment paper on the bottom of the pan and around the sides but couldn’t get it out. Please answer the question. Well, just loosen the parchment and take take them out of the cake pan. Hi there! This recipe is absolutely amazing so thank you! I wanted to try a matcha version next. 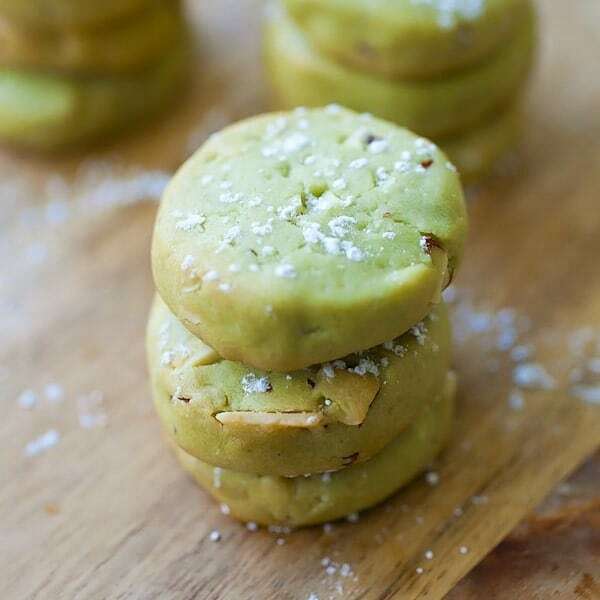 How much matcha do you suppose should be added and do I need to increase the sugar or decrease the flour? Looking forward to your input! Thank you so much for your detailed recipe! Because I can’t have dairy, I wrap all dairy ingredients to (vegan cream cheese, soy milk and vegan butter), could that be the reason? You can’t substitute the ingredients to vegan and expect the same results. Sorry.